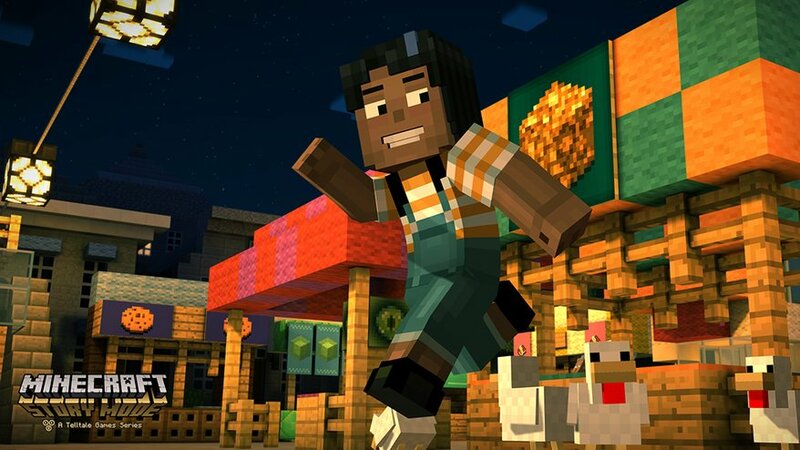 Minecraft: Story mode is an interactive story following Jesse and his/her friends on their adventure to save their world. 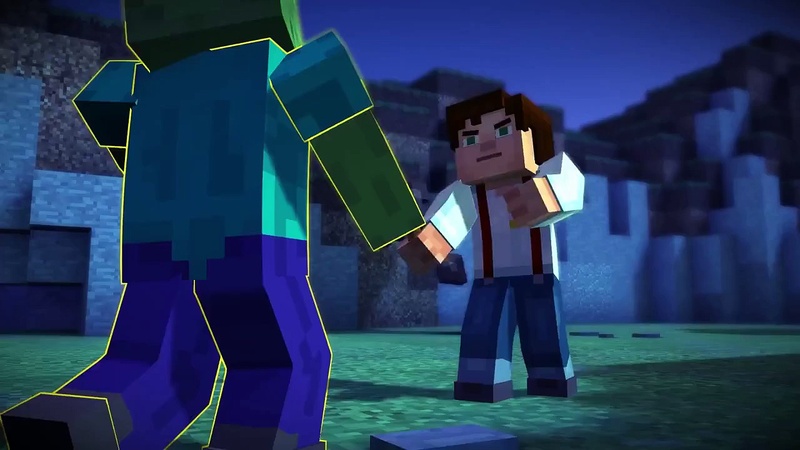 It is developed by Telltale Games in collaboration with Mojang. Released on all major platforms in both digital and physical releases. This review is for the PS4 version. You take the role of a Jesse (the name remains the same if you choose a male or female character) and the story opens up with yourself and your friends Axel, Olivia and pet pig Reuben planning out what to build in order to win in the Minecraft convention EnderCon. Things quickly go awry however leading the team with the help of some new friends on a grand adventure to find the Order of the Stone. 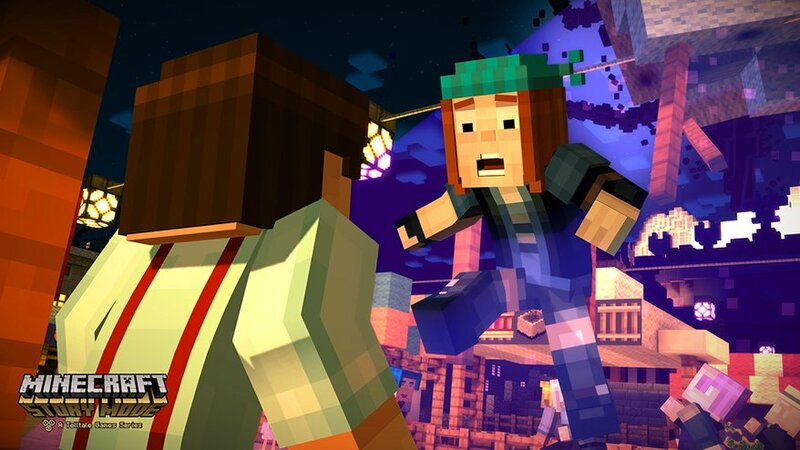 Combining Telltale’s now well known storytelling with the blank slate world of Minecraft was surely no easy task but a task Telltale have done well once again. 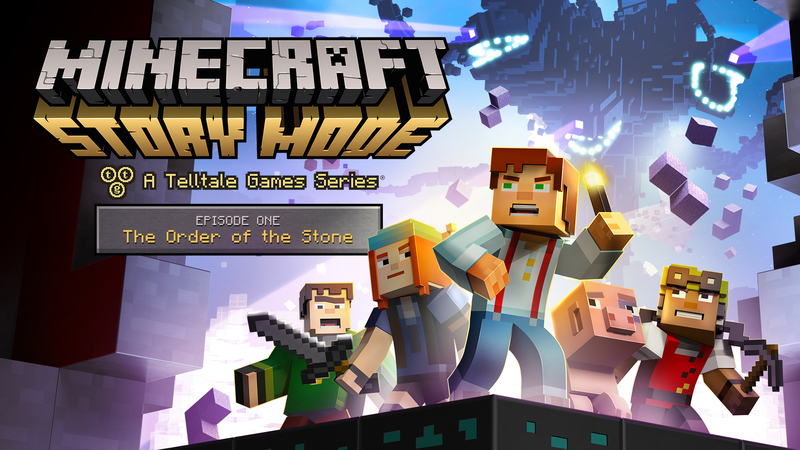 Story Mode is a bit of a lighter touch compared to recent entries by Telltale which have been somewhat more on the darker side with many more adult themes and references, Story Mode has almost perfected the balance of being more child friendly while at the same time not dumbing things down so much as to push non-minecraft fans out of the picture. Although the humour is certainly less present than in recent entries such as Tales from the Borderlands, there is enough slapstick & goofiness to giveme a few chuckles and on the flip side of that the drama and tension is kept quite high with the fast pacing even if the whole story does feel a little bit 80’s teen movie on a whole. Without going into the details of the story itself, Story Mode starts off as a bit of a slow burner compared to previous Telltale releases but once it gets going it goes non stop for the remaining 2 hours of the episode culminating in a good ending where one mystery is solved but another is reviealed. This has really left me excited for the next episode to release and hoping that the coming episodes keep up the speed and excitement of this one. All of the characters shown in the episode are likeable even if the lack of a backstory is a little annoying. The visuals are exactly what is expected, a colourful blocky world which stays true to Minecraft, there is nothing I saw in the Episode that could not be built in Minecraft using the basic assets. The only problem I had was that the graphical performance was often a little jumpy with quite a few stutters. 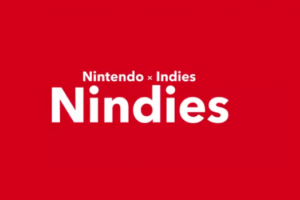 Sound design is a little more rocky though, the voice acting for the characters is mostly strong and the original music created for the game is great. 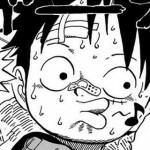 However sometimes the voice acting can come across as a bit forced and comically overacted (leading back to the 80’s vibe) and very often it is out of sync with the characters. Gameplay as with all Telltale titles leaves a little to be desired, mostly consisting of either walking around point-and-click sections or frantic out of nowhere Quick-time events with conversation choices at every turn. 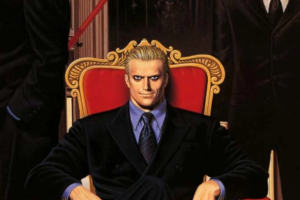 This style of limited gameplay isn’t really a problem as such because it allows you to generally sit back and just enjoy the story but I did find that some of the QTE’s did come with absolutely no warning so I often came very close to failing them, not that failing them makes more than a cosmetic difference on the most part. If you fail ALL the QTE’s in a section then you will likely get game over and you have to restart from a few seconds prior. This however is not the case with your conversation choices, you have a limited time to make a choice and unless you reply the entire episode then your choices will stick with you throughout the remaining episodes and will alter the outcome of events. For example I chose to pull my sword on a butcher and severely displeased him as a result, I have no idea if or when that choice may come back to haunt me. 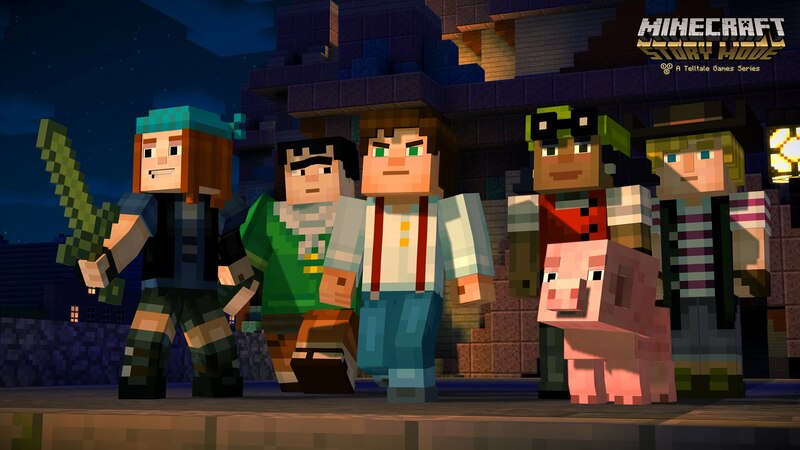 In conclusion after a slow start this story built up very nicely, is easily accessible by players of all ages and even people who didn’t like Minecraft. It’s lack of any real meaningful gameplay may put some people off but that would be a shame as the story already makes up for that.Though if you do not like episodial games then you would be best off waiting a few months and picking up the season pass when all 5 episodes have been released.